From 29 — 31 March, we will present four publications as a result of the Index program, edition 2018/2019. The index program is an annual program in which artists are stimulated by means of the conversation to make an analysis of their artistic practice. The result is converted into an experiment in printed matter. The program is an initiative of Meraki Agency. An artist-led organization that focuses on the emancipation of the artist / designer. By providing guidance on an individual basis in the analysis of the practice, the writing of applications and biographies, and the stimulation of knowledge sharing. 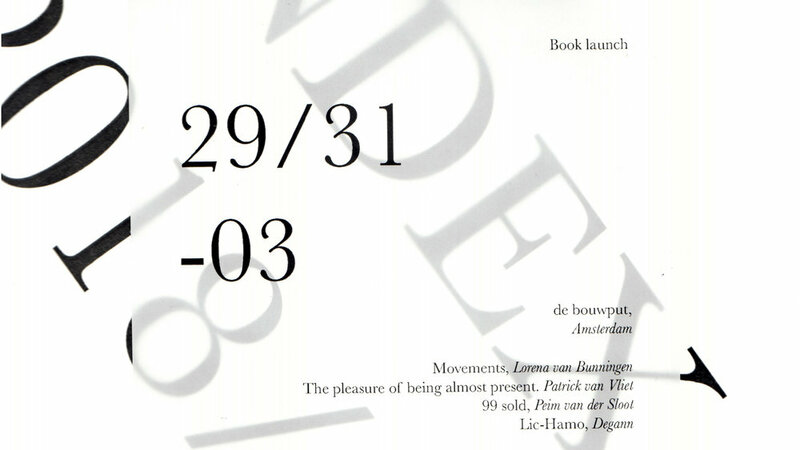 For this book, Peim van der Sloot has developed 99 new propositions to re-define the value of the work and the position of the artist in this old fashioned system. He encourages artists and arts organizations to attempt to create alternative micro-economies. These propositions are about art not as an input for productivity, or luxury made possible by economic growth, but rather as a new way to set the terms on which exchange in the economy takes place.The light-hearted and humorous propositions are up for different interpretations or combinations, but always carry a serious undertone, that stake out a new, more useful position for art in society.